The Specialized P1 is a jump bike with a plucky spirit and big plans. It is affordable enough to capture the attention of a mainstream audience and it is a sensible choice if you are just starting to get the grips with taking on dirt ramps and catching some big air, but you have not yet worked your way up to the more complex tricks and routines of the trade. As this is a bike which is expected to deal with rough and tumble treatment, you would not want it to have any real structural weaknesses. As such, the Cr-Mo frame, which has a distinct BMX look and feel to it, is thoroughly durable and tough enough to take the knocks and pressures which are inevitable if you want to take this bike soaring through the air. Of course to get any air, the bike needs to be light and nimble, which is why the Taper Cr-Mo fork offers precisely these qualities. It too is a solid, hard wearing item which is not so dainty as to make you cautious but not so weighty as to make the bike feel laboured through the bends or difficult to get up to speed on the straights. To go with the excellent frame and fork setup, you get Avid BB5 mechanical disc brakes as part of the standard package for the Specialized P1. These are capable components which give you the kind of stopping power that is required when things are starting to get a little out of control. Like the fork, these are light enough not to be a burden while still offering you the sturdy, durable build quality which is required for a jump bike of any kind. The 26 inch rims are double walled and constructed with alloy, giving you that extra shock-absorbing strength that is required. Some lesser jump bikes which prioritise cost cutting over performance will be good for your bank balance, but ultimately cost you more in the long run as you replace the parts which are not up to the job. This is where the value of the Specialized P1 comes into its own, because with quality components, it is less likely to fall foul of a poor landing or harsh road surface. This model lacks the suspension setup of its more expensive cousin, the P2. However, its rigid fork is not a disadvantage at this end of the market. It arguably is easier to handle and combined with the light, grippy Specialized Rhythm Lite Control tyres, it has more than enough impact-absorbing ability to call upon when the old adage of ‘what goes up must come down’ rings true. Like the rest of the range, the Specialized P1 is a very handsome bike, taking a subdued approach to design and opting for an all-blue frame which is not cluttered with decals or branding, as has been the bane of these models in the past. 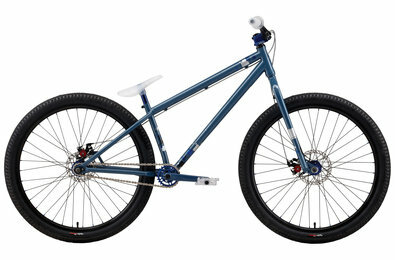 A solid, hardy bike of this kind is hard to find in this price bracket, but you have stumbled upon just such a model.